Whether it’s an intimate dinner, a celebration with friends or a big bash to mark a milestone at the office, a truly memorable hospitality experience involves a blend of essential ingredients. At George’s Mediterranean Bar and grill we are seasoned restauranteurs, who have established a stellar Sydney reputation for serving up cuisine, events and functions to suit every occasion. 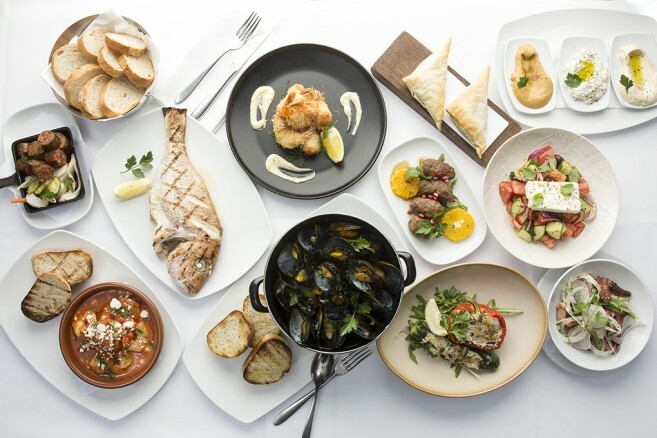 Imagine sumptuous seafood, succulent mains, and sensational share plates to enjoy among friends, all served with a distinctly Mediterranean twist. This is the heart and soul of our menu at Georges, where we source the finest seasonal produce available to serve up a menu packed full of exquisite flavour. Our menu is a nod to popular Greek flavours with a contemporary Australian influence, and it delights our clientele time and again. We utilise traditional mouthwatering Mediterranean accompaniments like lemon, olive oil, tomato, feta and rosemary to release the fresh flavours of every meal. George’s Mediterranean Bar and Grill owes much of its cooking technique and menu influence to our distinctly Greek roots. That sees our menu heavily focused food as a celebration. Share plates, or mezze, are a feature, and banquet dining is a highlight, while our a la carte is also destined to delight. As part of the Mediterranean tradition, many elements of the menu incorporate seafood, lamb, olives, feta and fresh produce, which are all items readily available and widely used for centuries in Greece. A true dining experience is one part food to satiate the soul, and one part a dining atmosphere to delight the senses. We’re proud to boast an enviable reputation for both. Located at Darling Harbour, our indoor/outdoor restaurant overlooks the lively ambience of the waterfront. From this vantage point we have the chance to witness some of Sydney’s most exciting events, but also enjoy an endless and ever-changing vista of the city’s picturesque harbour. There are the long, lazy days of summer, the twinkling lights of an autumn eve by the water, the crisp, cool colours of winter and the sparkling waterfront rejuvenation that comes with spring. Any time of the year, George’s offers a waterfront destination that is chic, comfortable and always designed to delight. At its heart hospitality is about service. It’s about feeling warmly welcomed, well cared for and indulged in an atmosphere of relaxed surrounds. With decades of hospitality experience, George’s Mediterranean Bar and grill is proud to offer service that complements our commitment to flavour and the welcoming ambience of our venue.